Chocolate Billionaires are full of crispy, crunchy caramel goodness surrounded by a chocolate coating. One taste, and you will agree that the name is totally appropriate! Some years ago, I came across a recipe for chocolate billionaires. From what I remember, it was in some sort of a pamphlet. The recipe looked good and also easy, so I gave it a try. That was the first of many times that I’ve made the chocolate billionaires for the holidays. Through the years, I’ve been told by a lot of people that the chocolate billionaires are a favorite candy. Who wouldn’t go crazy over crispy, crunchy caramel goodness covered in chocolate? I typically close my eyes to savor the first bite! I used the following ingredients to made these extraordinary confections: Caramels, water, rice krispies, toasted pecans and chocolate coating. For the first step in making the chocolate billionaires, I added the caramels and water to a heavy saucepan. Next, I melted the caramels over medium low heat. 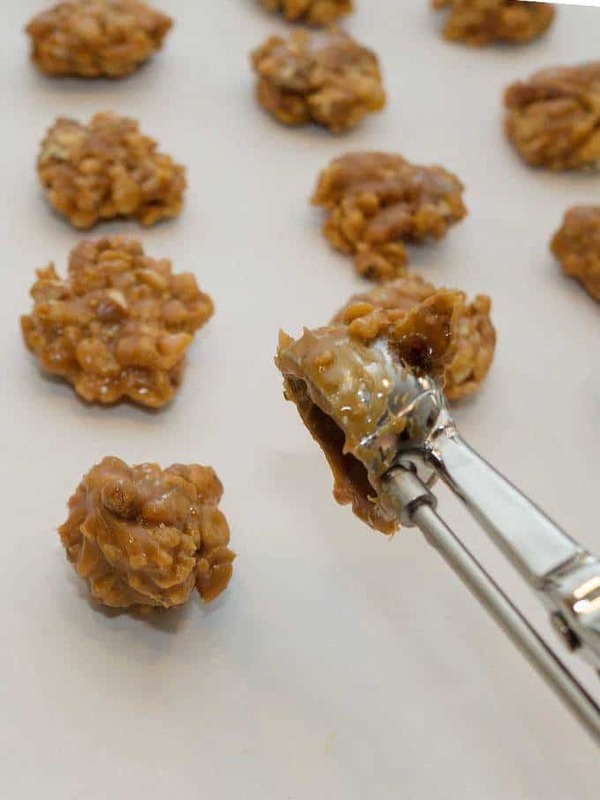 Once the caramels were fully melted, I added the rice krispies and pecans, and stirred the mixture with a wooden spoon to fully incorporate everything. Then, I used a small ice cream scoop to portion out the candy onto parchment lined baking sheets. Because the candy was quite sticky at this point I used parchment paper. I could also use a well buttered piece of waxed paper. Without the parchment paper, I would have a sticky mess. With the ice cream scoop, I ended up with rounded pieces of candy. I prefer a less round candy, so after it had cooled a bit, I flattened each piece of candy with my hand. Next comes the time-consuming part – the dipping of each piece of candy in chocolate. When I first started making the chocolate billionaires, I used chocolate chips melted with a little shortening for the coating. Now, I use Ghiradelli Dark Melting Wafers. I’ve tried different techniques for actually dipping the candy. I keep coming back to the use of a toothpick to actually hold the candy and another toothpick to help remove the coated piece of candy. I don’t worry too much about the candy being totally covered at first because it’s easy enough to finish off the top with a bit more of the coating. Is the effort worth it? Absolutely! I usually end up with about 4 dozen incredibly delicious little morsels. I generally package these by first putting them in individual mini muffin papers, and sealing three in a clear food grade polypropylene bag. Chocolate billionaires are one of my most requested holiday treats. Yum! Line two large baking sheets with parchment paper, or well greased waxed paper. Set aside. In a large, heavy saucepan, combine the caramels and water; cook and stir over medium low heat until smooth. Stir in pecans and Rice Krispies until well coated. Drop by teaspoonfuls onto prepared pans. Meanwhile, melt the chocolate candy coating in a double boiler over simmering water, making sure that the bottom of the pan with chocolate does not touch the water. Be careful not to boil the water. Dip each piece of candy into the chocolate, coating all sides. Place on prepared pans. When fully set, store in airtight container. Yield: 3 to 4 dozen, depending on size of each piece. *May use 3 cups of semi-sweet chocolate chips melted with 1½ teaspoons of shortening in place of the chocolate candy coating.